Put on a jersey and grab a ball for the ultimate pet sports experience that will excite and entertain the entire family! 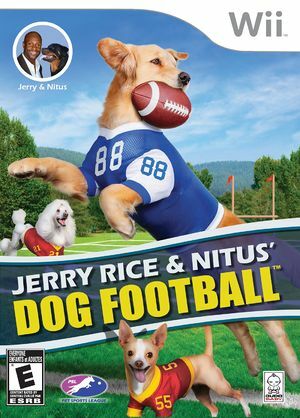 Jerry Rice & Nitus' Dog Football delivers the most delightfully humorous, pickup-and-play doggie action-sport game ever created for the Wii. Tight gameplay meets dog-simple play calling to unite the competitive spirit of families everywhere. Up to 4 players can compete co-op or head-to-head to run, pass, catch, kick, and tackle their way into doggie stardom! The graph below charts the compatibility with Jerry Rice & Nitus' Dog Football since Dolphin's 2.0 release, listing revisions only where a compatibility change occurred. This page was last edited on 12 January 2018, at 13:54.